The Bengalis who migrated to Malaysia were mainly from the Calcutta, Dacca, Chittagong and Midnapore areas of Bengal. As Bangladesh was a part of India until 1947, East Bengal (Bangladesh) shares a border with West Bengal in India. The few North Indians among the English speaking professional class in Malaya at that time were principally Bengalis from Calcutta or Dhaka. The first Bengalis in Malaysia, because they were well educated, were also well positioned in Malaysia. Most took up jobs in plantations, either in supervisory positions, or as "estate dressers". The estate dresser was the medical assistant, popularly known among the laborers as doctor. As most of the North Indians had embarked for their voyage to Hong Kong or Malaya from the port of Calcutta, the term "Bengalee" became a misnomer in these two countries. This mistaken notion about the Bengalees originating from a wider area in North India rather than only from East and West Bengal, persists until today. Most members of the Bengali community try to meet everyone else in the community at least three times a year at the major Bengali festivals: Durga Puja and Kali Puja (held between September-November) and Poila Boishakh, or Bengali New Year (celebrated in April). The Bengali community has its own property overlooking the sea in picturesque Port Dickson, and this is where a Prayer Hall has been erected. Bengalis congregate from all over Peninsular Malaysia as well as Singapore to celebrate Kali Puja and Poila Boishakh in Port Dickson. This property carries a sense of the community spirit and ethnic pride, as it was bought by a group of the original Bengali immigrants who donated half a month's salary for the purpose. Thus their second and third generation descendants now see it as 'a shrine'. Malaysian Bengalee Association (MBA) was established back in the 1920s by the bengalees who came over to Malaysia for jobs. 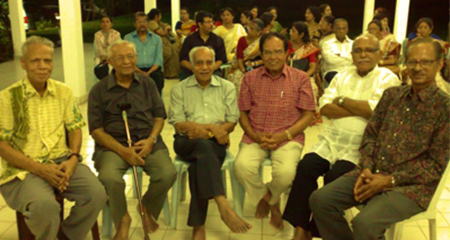 It was then registered in 1952 under the name "Malayan Bengalee Association". This name was later changed to "Malaysian Bengalee Association". 1965-1967: Mr H.K. Choudhury A.M.N. 1971-1972: Dr K.K. Mandal A.M.N. 1980-1983: Mr D.K. Bardhan P.M.C. 1986-1992: Mr D.K. Bardhan P.M.C. 1994: Dr K.K. Mandal A.M.N., J.P.
1998: Mr D.K. Bardhan P.M.C. 2002-2003: Mr D.K. Bardhan P.M.C.